Production: Toei Company; colour, 35mm; running time: 130 minutes. Producer: Jiro Tomoda, Goro Kusakabe; screenplay: Shohei Imamura, based on the novels Narayama bushi-ko and Tohoku no zunmutachi by Shichiro Fukazawa; photography: Masao Tochizawa; editor: Hajime Okayasu; assistant director: Kunio Takegishe; music: Shinichiro Ikebe; sound recording: Yoshiichi Beniya; costumes: Kyoto Isho. Cast: Ken Ogata ( Tatsuhei ); Sumiko Sakamoto ( Orinyan ); Tonpei Hidari ( Risuke ); Takejo Aki ( Tama-yan ); Shoichi Ozawa ( Shozo ); Mitsuaki Fukamizu ( Tada-yan ); Seiji Kurasaki ( Kesakichi ); Junko Takada ( Matsu-yan ); Mitsuko Baisho ( Oei ). Variety (New York), 25 May 1983. Tesson, C., and Y. Lardeau, Cahiers du Cinéma (Paris), June-July 1983. Renaud, C., 24 Images (Montreal), Autumn 1983. Masson, A., and others, Positif (Paris), September 1983. Tessier, M., Revue du Cinéma (Paris), September 1983. Magny, J., Cinéma (Paris), October 1983. Beaulieu, J., Séquences (Montreal), January 1984. Rayns, T., Monthly Film Bulletin (London), May 1984. Stanbrook, A., "Taking Mum to the Mountain" in Stills (London), June-July 1984. Breen, M., Cinema Papers (Victoria), August 1984. The Ballad of Narayama is perhaps one of the most overrated films of recent years, an ahistorical fantasy by an urban intellectual about a rural society that never existed. Its favourable reception among some critics and audiences is more interesting than the film itself, which fails as a drama, as a commentary on Japan and as a philosophical statement. The film is based on two novels by Fukazawa Shichiro, each of which has been adapted for the cinema before, Narayama bushi-ko in 1956 and Tohoku no zunmutachi in 1957. Imamura's decision to combine them in one allegedly realistic film, made to resemble a documentary as much as possible, is one of the sources of the film's dramatic weakness. The central plot device, the decision of Orin, an aged widow, to sacrifice herself on the mountain (Narayama) so that her family may survive, is discussed and elaborated so often that many viewers will wonder why she does not just hurry up and carry it out. It is also obscured by subplots, in which her elder son Tatsuhei enters a second marriage; her grandson Kesakichi loses his lover Matsu when her entire family is killed because her father is a thief; and her younger son Risuke, shunned by the other villagers because he smells bad, is fixed up with a woman for the first time in his life. The narrative depends for its effect on treating legends about ancient Japan as if they were historical truths. Yet there never was a real mountain where old people abandoned themselves, or were abandoned, to the elements; there is no historical evidence that thieves were killed by their fellow-villagers, let alone their entire families; as for Risuke, perhaps people who smelled bad were indeed shunned in primitive Japan, but it is now impossible to know, nor are we told why Risuke has this particular problem—or, for that matter, how everyone else in the village manages to smell good. Imamura's refusal to specify where and when the events he depicts are taking place consigns them to an undifferentiated "Past" which has no plausibility, either as legend—in contrast, for example, to Oni Baba, or Ingmar Bergman's The Seventh Seal —or as a basis for trustworthy or thoughtprovoking reflection on the present. Skillful cinematography, acting or other elements can sometimes compensate for deficiencies in the direction or writing of a film, but not in this case. The progress of the year from winter to winter is laboriously and clumsily indicated by predictable clichés: rice shoots in spring, shimmering heat in summer, leaves changing colour in the fall and snow falling and falling, with soporific effect, in winter. 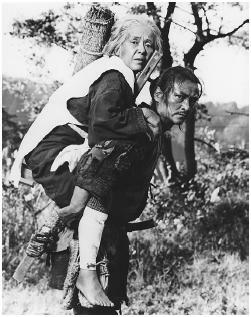 The actors in the film have evidently been encouraged to represent primeval drives by grunting and shouting throughout the film, and can do little with their impossible roles, ranging from the saintly Orin herself, through her sons, one laughably macho, the other irritatingly pathetic, to the monotonously hysterical Matsu. It is particularly distressing to see Baisho Mitsuko and Ogata Ken, two highly intelligent and sophisticated actors, reduced to performing as pawns in Imamura's game, his attempt to present a shallow and unconvincing utopia as if it was once, or ever could have been, a real society. The novelist Fukazawa's intention was to recreate what he believed had been the way of life of the ancient Japanese, before the importation of, first, Chinese influences and, later, Western influences which have, in his view, corrupted the "purity" of Japanese culture. Imamura's intention seems to be to pass off such harmless, if threadbare, fantasies as if they were not only historically accurate but also spiritually resonant or philosophically stimulating. But there is no irony, humour or other distancing effect in the film, and Imamura excludes any character capable—as almost all real human beings have always been capable—of reflection or questioning about the customs being observed. But by demeaning the people in the film Imamura implicitly demeans the people watching it, and the gap between his grand ambitions and his shoddy achievements presents its own stark contrast with the skillfully plotted, beautifully staged and acted, historically accurate and deeply moving masterpieces of Kurosawa, Mizoguchi and other genuine masters of the Japanese cinematic tradition. It is striking that this film, which had limited critical and commercial success in Japan, won the Grand Prize at the Cannes Film Festival in 1983 and was hailed as a masterpiece by leading Western film critics, many of whom knew little or nothing about Japan, past or present. This suggests that some Western filmgoers still cling to an outdated, misinformed and even racist notion of Japan as extremely alien and exotic, a country of people "close to nature" whose films can be patronised by refusing to apply normal critical standards to them; and that some Japanese, including Imamura, are all too happy to foster such attitudes, for their own nationalistic reasons.